There is something so delightfully romantic about getting postcards from abroad! Yesterday I received one of Melk Abbey, in Austria, from an American friend who spent the month of March touring Europe. Austria is down on my list of places I want to visit before I am old: this is partly due to growing up with “The Sound of Music”, and even more so to the charm of Eva Ibbotson’s Austrian novels (Magic Flutes is a particular favourite). 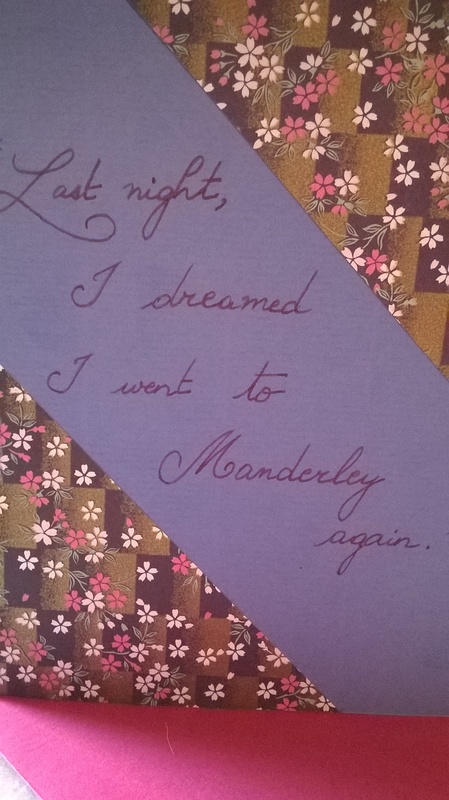 As I admired my postcard, something about it rang a bell. Somehow the façade of the abbey seemed familiar. And then I realized I’d read a description of it several months ago, in Patrick Leigh-Fermor’s A Time Of Gifts. When Leigh-Fermor was eighteen, he decided to walk across Europe, all the way to Constantinople. Sometime in mid-January 1934, while on his way to Vienna, he stopped at Melk. The pages in which he describes his memories of the place are truly marvellous – armchair travelling at its best. High on a limestone bluff, beneath two baroque towers and a taller central dome, tiers of uncountable windows streamed away into the sky. It was Melk at last, a long conventual palace cruising above the roofs and the trees, a quinquereme among abbeys. No janitor was about. A young Benedictine, finding me loitering in the gatehouse, took me in tow, and as we crossed the first great courtyard, I knew I was in luck. He spoke beautiful French; he was learned and amusing and the ideal cicerone for all that lay ahead. Afterwards, it was in confused musical terms that the stages of our progress strung themselves together in my memory. This is how they resound there still. Overtures and preludes followed each other as courtyard opened on courtyard. Ascending staircases unfolded as vaingloriously as pavanes. Cloisters developed with the complexity of double, triple and quadruple fugues. The suites of state apartments concatenated with the variety, the mood and the décor of symphonic movements. Among the receding infinity of gold bindings in the library, the polished reflections, the galleries and the terrestrial and celestial globes gleaming in the radiance of their flared embrasures, music, again, seemed to intervene. A magnificent and measured polyphony crept in one’s ears. It was accompanied by woodwind at first, then, at shortening intervals, by violins and violas and ‘cellos and then double basses while a sudden scroll-work of flutes unfurled in mid-air; to be joined at last by a muted fanfare from the ceiling, until everything vibrated with a controlled and pervading splendour. Beyond it, in the church, a dome crowned the void. Light spread in the painted hollows and joined the indirect glow from the ovals and the lunettes and the windows of the rotunda. Galleries and scalloped baldachinos and tiered cornices rose to meet it; and the soft light, falling on the fluted pilasters and circles of gold spokes, and on the obelisks wreathed with their sculpted clouds, suffused the honeycomb side-chapels and then united in a still and universal radiance. Music might just have fallen silent; unless it were about to begin. In the imagination, instruments assembled – unseen cymbals just ajat that would collide with a resonance no more strident than a whisper; drums an inch below their padded sticks with palms ready to muffle them; oboes slanting, their reeds mute for a moment more; brass and woodwind waiting; fingers stretched motionless across the wires of a harp and fifty invisible bows poised in the air above fifty invisible sets of strings. For me the famous buildings were a peak in a mountain range of discovery which had begun at Bruchsal and continued long afterwards. Again and again during these weeks I was to find myself wandering through great concavities illuminated by reflections from the snow. Sunlight flared in lintels and broken pediments, and streamed in over snowy sills so close to the ceilings that they gave a last lift to the trompe l’oeil Ascensions and Transfigurations and Assumptions as they poured across them and quickened the white and cream wreaths of stucco holding them aloft: garlands doubly etherealized by the reverberated radiance of the snowflakes, and composed of all that reed and palm-leaf and tendril and scallop and conch and the spines of the murex can inspire. In this high baroque style, halted at a point on the frontier of rococo where the extravagant magic of later decades is all implicit, how easily the same aesthetic mood glides from church to palace, from palace to ballroom, from ballroom to monastery and back into church again! Paradox reconciles all contradictions. Clouds drift, cherubim are on the wing, and swarms of putti, baptized in flight from the Greek Anthology, break loose over the tombs. They try on mitres and cardinals’ hats and stumble under the weight of curtains and crosiers while stone Apostles and Doctors of the Church, who are really encyclopaedists in fancy dress, gaze down indulgently. Female saints display the instruments of their martyrdom as light-heartedly as dice-boxes and fans. They are sovereigns’ favourites, landgravines dresssed as naiads; and the androgynous saint-impersonating courtiers who ogle the ornate ceilings so meltingly from their plinths might all be acting in a charade. Sacred and profane change clothes and penitents turn into dominoes with the ambiguity of a masked ball. In the half-century following Melk, rococo flowers into miraculously imaginative and convincing stage scenery. A brilliant array of skills, which touches everything from the pillars of the colonnade to the twirl of a latch, links the most brittle and transient-seeming details to the most magnificent and enduring spoils of the the forects and quarries. A versatile genius sends volley after volley of fantastic afterthoughts through the great Vitruvian and Palladian structures. Concave and convex uncoil and pursue each other across the pilasters in ferny arabesques, liquid notions ripple, waterfalls running silver and blue drop to lintels and hang frozen there in curtains of articial icicles. Ideas go feathering up in mock fountains and float away through the colonnades in processions of cumulus and cirrus. Light is distributed operatically and skies open in a new change of gravity that has lifted wingless saints and evangelists on jouneys of aspiration towards three-dimensional sunbursts and left them levitated there, floating among cornices and spandrels and acanthus leaves and architectural ribands crinkled still with pleats from lying long folded in bandboxes. Scripture pastorals are painted on the walls of the stately interiors. Temples and cylindrical shrines invade the landscape of the Bible. Chinese pagodas, African palms, Nile pyramids and the a Mexican volcano and the conifers and wigwams of Red Indians spring up in Arcady. Walls of mirror reflect these scenes. They bristle with sconces, sinuous gold and silver boundaries of twining branches and the heaped-up symbols of harvest and hunting and warfare mask the joins and the great sheets of glass answer each other across wide floors and reciprocate their reflections to infinity. The faded quicksilver, diffusing a submarine dusk, momentarily touches the invetion and the delight of this looking-glass world with a hint of unplanned sadness. But one is always looking up where those buoyant scenes in grisaille or pastel polychrome, unfolding elliptically in asymmetric but balancing girdles of snowy cornice, enclose room after room with their resplendent lids. Scriptural throngs tread the air among the banks of vapour and the toppling perspectives of the balustrades. Allegories of the seasons and chinoiserie eclogues are on the move. Aurora chases the Queen of the Night across the sky and Watteau-esque trios, tuning their lutes and their violins, drift by on clouds among ruins and obelisks and loosened sheaves. A sun declining on a lagoon in Venice touches the rims of those clouds and veils the singing faces and the plucked strings in a tenuous melancholy; irony and pity float in the atmosphere and across the spectator’s mind, for there is little time left and a closing note sounds in all these rococo festivals. A bit tipsy… It was quite true. Wa had been talking about the rococo interplay of spiritual and temporal, and for a few instants, at these last words, my companion was transformed as well: habit, scapular, cowl and tonsure had all vanished and a powdered queue uncoiled down his brocaded back from a bow of watered silk. He was a Mozartian courtier. His light-hearted voice continued its discourse as he stood with his left hand poised on his sword knot. With explanatory sweeps of a clouded cane in his right, he unravelled the stratagems of the ceiling-painter; and when, to balance the backward tilt of his torso, he advanced a leg in a Piranesi stance, I could all but hear a red heel tap on the chessboard floor. One of the Abbey’s bells began tolling on a more insistent note and, with an apology from my mentor, who was safely back in his native century, we hastened our step. In a few minutes I was several fields away, high above the Danube with the dome and the cupolas already dropping out of sight below a clump of trees. Twin gold crosses followed them and the cross on the dome last of all. Nothing remained in those hills to give the Abbey’s presence away. The vanished pinnacles might have been the pigeon-loft of a farm. Un peu gris. It was too mild a term. From Patrick Leigh-Fermor, A Time Of Gifts, Chapter 6 (1977). It is my considered opinion that nature intended man to hibernate throughout the months of January and February, only awakening around the ides of March, when spring sunshine sets the raindrops sparkling and everything is young and fresh and green (did you know that in the oldest Roman calendar, the new year only began in March? I’ve said it before, and I’ll say it again: the Romans had everything right). To be forced to rise in the dark and toil one’s way to work in the bitter cold of a winter morning is one of life’s many injustices. It seems perfectly obvious to me that we ought instead to be snuggling down beneath the covers for as long as possible, and then spending the short hours of daylight and the long lamplit evenings curled up on the sofa drinking tea, enjoying the last of the season’s mince pies, and either reading or watching movies. That being impossible (or at any rate, incompatible with the tiresome business of earning a salary), one must seek consolation elsewhere. But what, you may well ask, is there to do at this time of year? The Christmas festivities are far behind us, and Easter still too far ahead. February stretches before us, dull and dreary. Interminable, despite its mere 28 days. To be sure, there is Valentine’s Day, with all its attendant panoply of hearts and roses, chocolates and kitsch cards, expensive restaurants and even more expensive lingerie purchases. Fine. That still only takes care of one out of the twenty-eight days. Do not despair! For those who are so inclined, there is a remedy. For today marks the beginning of International Correspondence Writing Month (also known – quelle horreur! – as InCoWriMo). And what, pray, is that? That, good people, is a noble endeavour, in these dark and degenerate times, where the email reigns supreme, to revive the all but lost art of letter-writing. It is a challenge. It is the missing ingredient that will add zest to your daily lives. It is the star to every wandering bark. 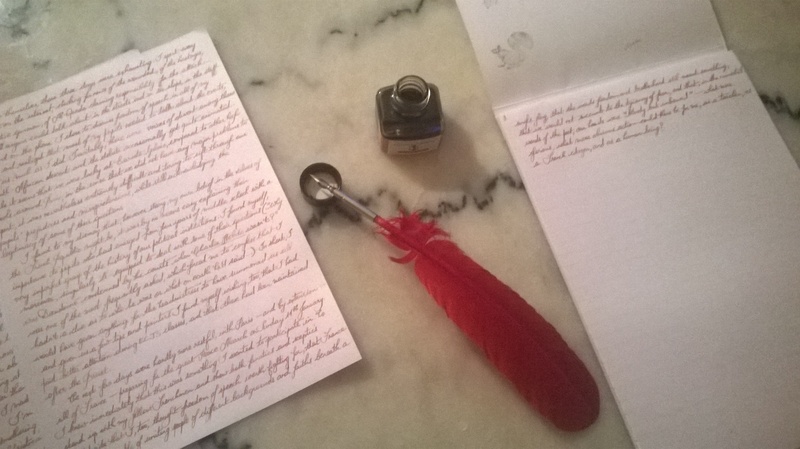 It is, in short, a pledge to write a letter everyday throughout the month of February. To make it more interesting, you even receive letters in return! A full and detailed explanation is available on the InCoWriMo website, which is worth a visit if only for the whimsical picture of an oversized snail, laden with brown-paper packages and old-fashioned mail bags, which heads the home page. Ink Drops: Carla and Annastasia send you a hand-written note with any purchase you make on their website. My brother got me their Keep in Touch box for my birthday, and it was full of pretty surprises! Cressida Bell: Cressida is the grand-daughter of Bloomsbury painter Vanessa Bell, and an artist in her own right. Her selection of cards is truly beautiful! Rifle Paper Co.: This famous American stationery company has so many wonderful things for sale that the mind simply boggles. I think I can safely say I want every single item on the website. Now, if you’ll excuse me, I have a letter to finish. 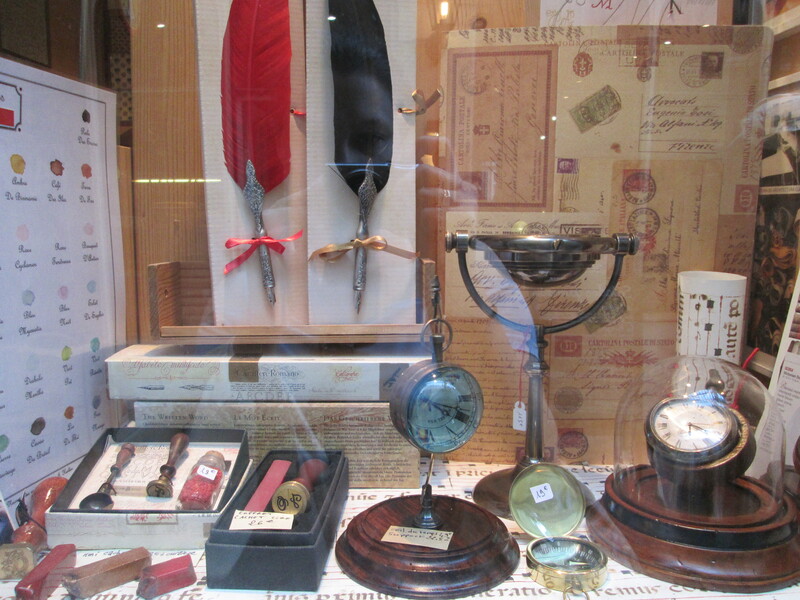 “Vélin de France” paper by G. Lalo, Paris; goose quill with steel nib; “Rouille d’ancre” ink by J. Herbin. It has been many moons since I last posted anything here. It’s not so much that I don’t want to, as that I don’t seem able to, somehow. Which doesn’t mean that I haven’t been reading. I have a pile of books to review! But whenever I consider sitting down to work on one, I feel a treacherous apathy creep over me, which has been affecting all my writing. I have gradually taken up composing letters and journal entries again, and I have managed to write a few more pages of my novel, but I haven’t got around to blog posts yet. In the meantime, I have been dabbling in arts and crafts. Back in June, I bought some lovely new stationery, including a set of mint green-coloured blank notecards and matching envelopes. 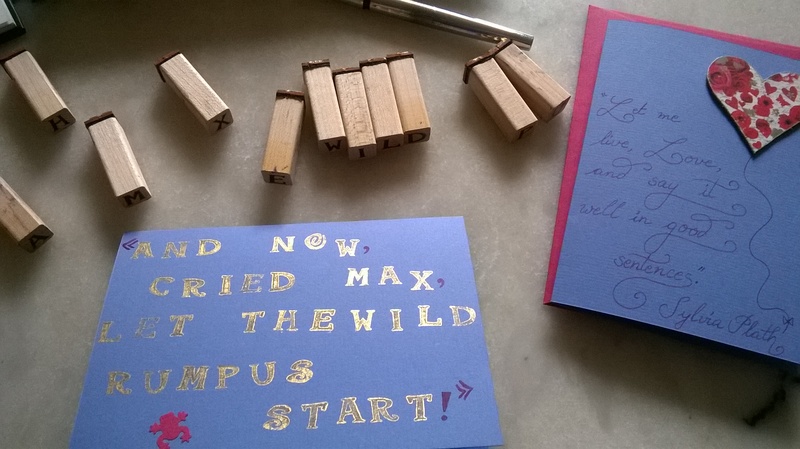 I had a lot of fun customising these with stickers, rubber stamps, decorative hole-punchers, and a selection of bookish quotes, ranging from Shakespeare to Walt Whitman, to Elizabeth von Arnim. The Japanese rice paper in all its glory. In fact, I enjoyed myself so much that I have decided to renew the experience every season. 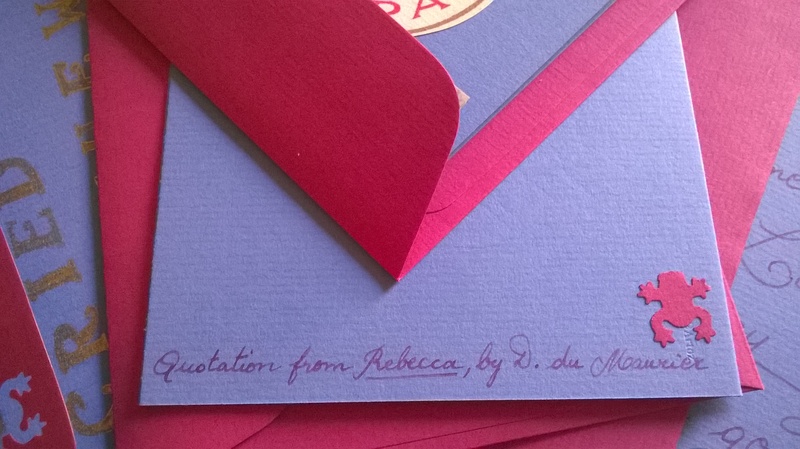 This September I chose lavender-blue notecards with magenta envelopes. The quotes I finally settled upon this time were by Sylvia Plath, Daphne du Maurier, or Maurice Sendak. A timely birthday present from my sister-in-law allowed me to play around with Japanese rice paper in pretty patterns. The best part – but also the greatest challenge – is finding suitable quotes. I’m a bit tired of coming across yet another “It is a truth universally acknowledged” card in the bookshops; however much I love Pride and Prejudice, it strikes me that the immense choice of literary works out there should allow for a little variety. So here’s a little game I’d like to play with you, if you’re willing: post your favourite quote in the comment box below and, when I do my next batch of cards in December/January, I’ll use a few and post pictures of the results on this blog. Oh, and there’s a also a quick survey I concocted, just for fun! I am supposed to be saving up for my trip to Italy this July. Ha ha, isn’t that a joke! There I was yesterday, minding my own business, reading Lytton Strachey’s Biographical Essays and finishing up my lunch, when I was assailed by an ungovernable urge to splash out on luxury stationery (see, that’s what comes of writing letters early in the day). Conscience tussled briefly with desire, and lost: for “The only way to get rid of temptation”, wrote Oscar Wilde, “is to yield to it.” Well, if Oscar said it, then it must be true, so off I trotted to Paris, where I just happened to know of a wonderful stationer’s shop – a veritable Aladdin’s cave! – in the sixth arrondissement. Get off the metro at “Odéon” and you find yourself plunged in Revolutionary Paris. The huge bronze statue of Danton, which was erected on the site of the house where the lawyer and Revolutionary politician used to live, is a popular meeting place for students, who mill about and perch on the plinth, smoking and talking loudly. Just down the road is one of the oldest café-restaurants in Paris, the Procope, where Voltaire and the Encyclopaedists used to argue over coffee, and later on, Danton, Marat, and Robespierre. And across the street yawns a tall archway, leading down one of the few remaining pre-Haussmann – pre-Revolutionary! – covered passages in Paris: the Cour du Commerce St André. 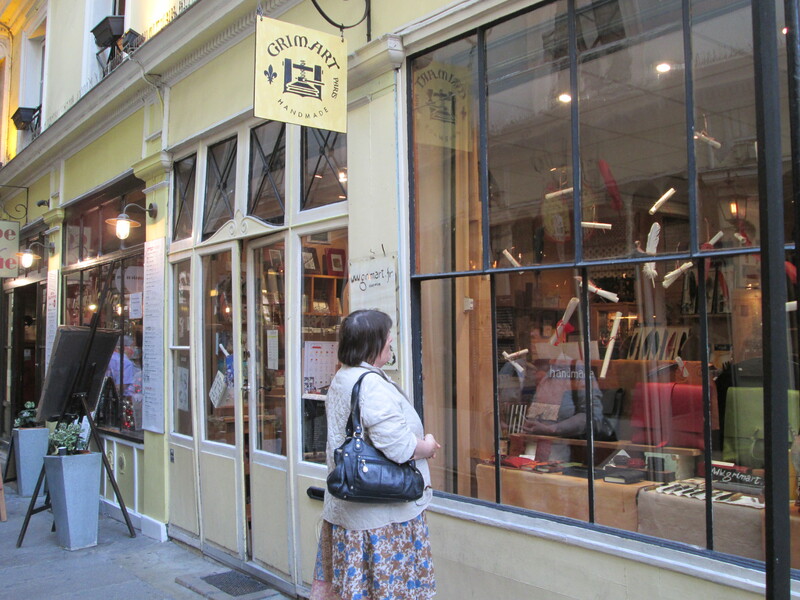 Narrow, cobblestoned, and cambered, this passage is one of the most difficult Parisian streets to negotiate in heels. Actually, it’s difficult to walk down, period. But it is so picturesque that it is well worth the risk of spraining an ankle. If you walk past the cafés, the chocolate factories, and the back entrance of the Procope (where Robespierre curls his lip at you from his portrait in the window), you reach a pair of black wrought-iron grilles, which used to close off the street at night from nocturnal wanderers of ill-repute or ill-intent (a necessary precaution, when you think of what happened to Marat). Just beyond those gates is the façade of Grim’Art, an old-fashioned stationer’s shop held by a quiet Italian gentleman and (I presume) his wife. I make it a rule not to come too often to this part of Paris. The temptation to step into Grim’Art is simply too great, else. It’s not as if my banker liked me (I have this slight problem with buying books). There’s no need to give him excuses to call me up and yell at me. 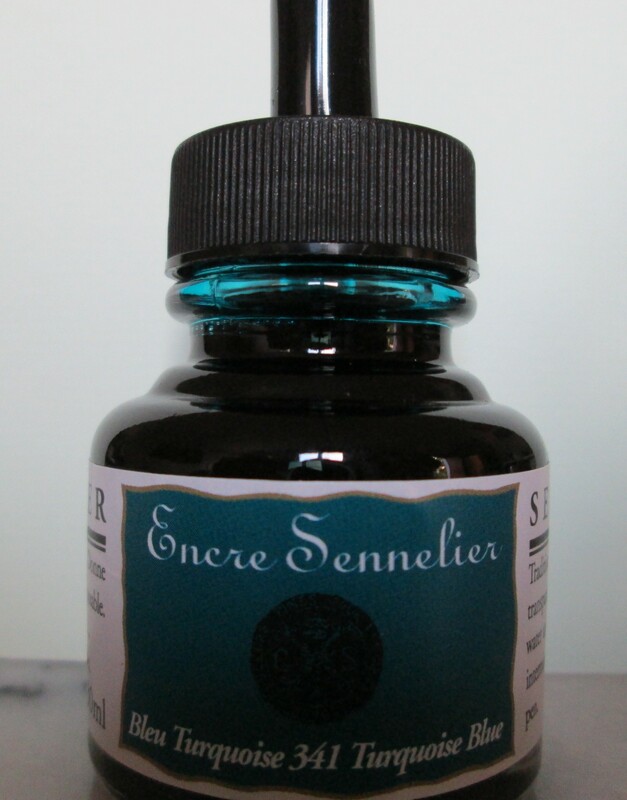 Jean Herbin was an enterprising seventeenth-century sailor who, in 1670, founded a company that manufactured ink and sealing wax, thanks to formulas he brought back from his trips to India. Such was Herbin’s success that he counted the Sun King himself among his customers. Later on, the company was able to add Victor Hugo and Coco Chanel to its list of illustrious clients. 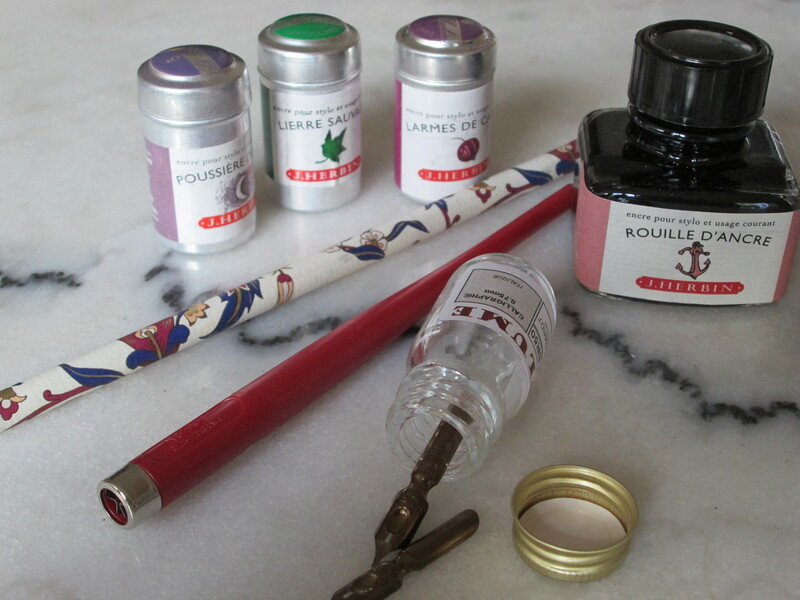 As for me, I bought cartridges for my fountain pen in three different colours (“Poussière de Lune”, “Lierre Sauvage”, and “Larmes de Cassis” – “Moondust”, “Wild Ivy”, and “Blackcurrant Tears” respectively) as well as a bottle of “Rouille d’Ancre” (meaning “Anchor Rust”), which, I confess, I chose as much for the name as for the colour. The Victorian naturalist within me also fell prey to a couple of pretty lepidoptera-themed postcards. It could all have ended there. But it was such a beautiful afternoon that I decided to walk down the Boulevard St Germain – and that’s where I came across a large art supplies store that sealed my fate. A bottle of ink, I reasoned, necessitated a pen of some sort, or it was useless. But all my quills and wooden pen-holders were seven hundred kilometres away, in the attic of my parents’ house. Therefore (kindly admire my infallible logic) I was perfectly justified in buying new ones. 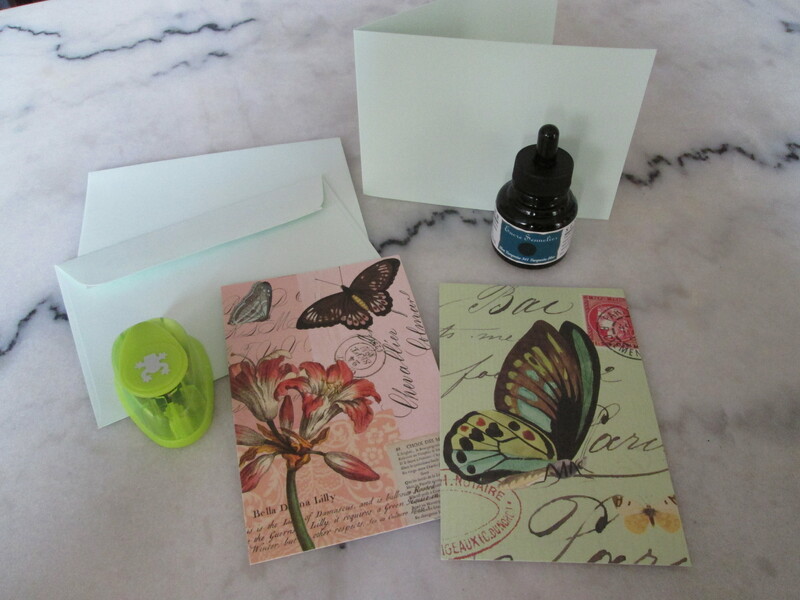 Half an hour later, I emerged with a scarlet pen-holder, a glass vial containing two new steel nibs, a bottle of turquoise ink, a mint green card and envelope set, and – for a touch of whimsy – a small green frog-shaped paper puncher. Ahem. Well, there was no need to hang around for cabbages and shoes. I went home, took Doggy for a walk before dinner, and smiled a smile of pure contentment when I heard the fluting of the frogs from a nearby pond. Oh dear, oh dear. It’s been ages since I posted a book review. Somehow January and February slipped by without my noticing, and March seems set on following their lead. Oops. And yet it seems like only yesterday that the whole family was gathering for the Christmas festivities: brothers and sister, future in-laws, and my little nephew, who is now – amazingly – a year old. Up till now, my nephew has treated the board books I have given him merely as colourful chew toys, but watching him during the holidays, I realized with anticipatory pleasure that he will soon be old enough for storybooks. The thought sent me to the two huge bookcases of children’s books in the dining-room, which date back to the now distant time when we would all gather on my parents’ bed after dinner, for story hour. 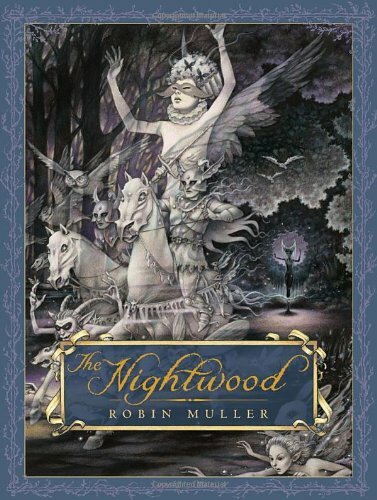 Browsing among the wonderful titles and beautifully-illustrated dust-jackets that lined the shelves, I came across The Nightwood by Robin Muller, which was a favourite of mine for many years. I couldn’t resist: I pulled it off the shelf and, later that night, when I was cosily ensconced in bed near the fire in the TV room, with a dog curled up at my head and another at my feet, I settled down contentedly to re-discover this old favourite. Based on the Celtic legend of Tamlynne, The Nightwood tells the story of Elaine, the spirited only daughter of the Earl of March. Elaine has all but outgrown nursery stories and is growing increasingly restless at having to sit demurely indoors at her embroidery, day after day. Yet her father continues to treat her as a child. When he refuses to let her attend the up-coming ball he is organising, Elaine furiously decides to run away. Elaine knows there is dancing at the Elfin Queen’s court. The elves have taken over the wood at the edge of the Earl’s lands and many dark tales are told of youths and girls disappearing amid the trees and never being seen or heard of again. But of course, the possibility of danger only increases the allure of the escapade… It doesn’t take long for Elaine to run headlong into adventure. In the wood, she comes across a solitary rose bush and, just as she is stretching out her hand to pluck one of the roses, there is a tinkling of bells and a young man appears before her, with a string of tiny elfin bells about his waist. He is Tamlynne, favourite knight of the Elfin queen and guardian of the rose bush, whose blossoms have magical properties. Tamlynne whisks Elaine away to the very heart of the wood, where, in a clearing among the trees, a phantom orchestra plays unearthly music and couples dance by the light of the moon. Together they dance until the first light of dawn disperses the shadows and sends Elaine running back to her father’s castle. Night after night from that time forth, Elaine slips out to join Tamlynne in the woods. At length, however, the Earl catches on to what is happening and locks his daughter up. Elaine knows she must somehow escape and find her way back to Tamlynne before it is too late: for Tamlynne is a mortal, one of those lured away from their homes and their families by the power of the elves, and on All Hallows Eve, his soul will become forfeit to the Elfin Queen. Only mortal love can save him. Elaine must come face to face with the Elfin Queen herself and fight for Tamlynne before he is lost to her forever. Elaine’s rebelliousness and courage make her an endearing heroine, and I, for one, have always found her fascination with the Nightwood and the elves (hauntingly depicted by Robin Muller) very easy to relate to. Situated beyond the gardens and farmlands of the Earl’s estate, and therefore also beyond the borders of his jurisdiction, the wood is a wild place, both undomesticated and unknown, full of unplumbed secrets most attractive to the adventurous mind. It is uncharted territory and, as such, it represents freedom. But as Elaine quickly discovers, it is also a place of potential danger. The elves lurking within the dark recesses of the wood embody this duality – in a way they are the Celtic equivalent of the role played by Pan in Greek mythology. The Elfin Queen’s rose encapsulates the dual nature of the wood: its magical properties are called upon to protect Elaine from the power of the elves, guaranteeing her safe passage through the woods; yet at the same time, an adult reader is very much aware of the connotations attached to the rose – or, more specifically, to the plucked rose. It is not insignificant that Elaine’s arrival in the wood should coincide with the plucking of a rose, nor that it should be a man who does the plucking. The rose Tamlynne picks and gives to Elaine can thus be seen as a symbol of lost innocence, not to say lost virginity. In fact, in most versions of the Tamlynne story, the heroine comes home pregnant from her nocturnal wanderings. In this light, her father’s decision to lock her up can be interpreted as shame at her pregnancy, just as the urgency with which she seeks out Tamlynne again can be seen as stemming from a desperate need to legitimise their union. Whether Elaine’s fierce struggle to win Tamlynne’s hand is motivated by love or necessity, however, her journey into, and out of, the wood takes on all the importance of an essential rite of passage. Nowadays, the character that interests me most is the eponymous hero of the legend, Tamlynne. Tamlynne is a shadowy, mysterious figure – ergo, highly romantic. All that we know about him is that he is one of those who succumbed to the treacherous allure of the elves, and that he has been bound to their queen for seven years. But what exactly does it mean, to be the favourite knight of the Elfin Queen? The term implies that the relationship is of a sexual nature. This makes Tamlynne one of a literary brotherhood of knights-errant – both wandering and erring – who, in entering the forest, have strayed off the beaten track and, discarding the codes of acceptable behaviour and forsaking the duties attendant upon their rank, have allowed themselves to be seduced by a sorceress/femme fatale. Keats’ “palely loitering” knight-at-arms, pining for La Belle Dame Sans Merci; Tannhaüser and Venus (and yes, this is probably the only time you shall ever hear me mention Wagner, so make the most of it! ); Prince Rilian and the Lady of the Green Kirtle – like Tamlynne and the Elfin Queen, all of these couples speak of the power of sensual pleasure. It needed all the strength of Elaine’s love, and her extraordinary will-power, to bring Tamlynne back to the consciousness of the life he had left behind, and to make of him a husband, a father, and a lord. There are times, however, when I cannot help regretting – just a little bit! – that she could not leave him be. There is a sweetness to freedom of which I have not yet grown tired and, given a choice, I do not think I would have forsaken the elves. Saturday 1st March. Eleven thirty on a bright, chilly morning, in one of the seedier suburbs of Paris. Peeling billboards, a graffitied bus shelter, and massive façades of dismal grey concrete. A car parked on the curb, the open trunk containing a treasure unsuspected by passersby. A parting handshake, and I walk away feeling slightly stunned. I have just made the best deal of my life. It had all begun a few days previously, at 2:00 a.m. on a February night of wind and rain-spattered window panes. Yet again, I had been trawling the internet in search of the perfect, affordable, vintage typewriter. I had seen dozens of Olivettis (all ugly); scores of 1970s Olympias (simply unmentionable); a blue and grey Japy Script from the 1960s with a matching case lined in snazzy red artificial silk; a delightful green Erika, also from the 1960s, which I was half-tempted to buy; and countless other models in various states of disrepair. But what I really lusted after, what I had lusted after for nigh on fifteen years, were the American Streamliners of the 1930s, preferably by Remington or Smith-Corona. And of those, there were none. That’s when I stumbled upon an ad that changed everything. All it said was “Old Typewriter for Sale” but something about the poor quality picture caught my attention. I peered at it more closely and all of a sudden, my heart gave a lurch of excitement. Could it be??? Again I squinted at it, my nose almost touching the computer screen. 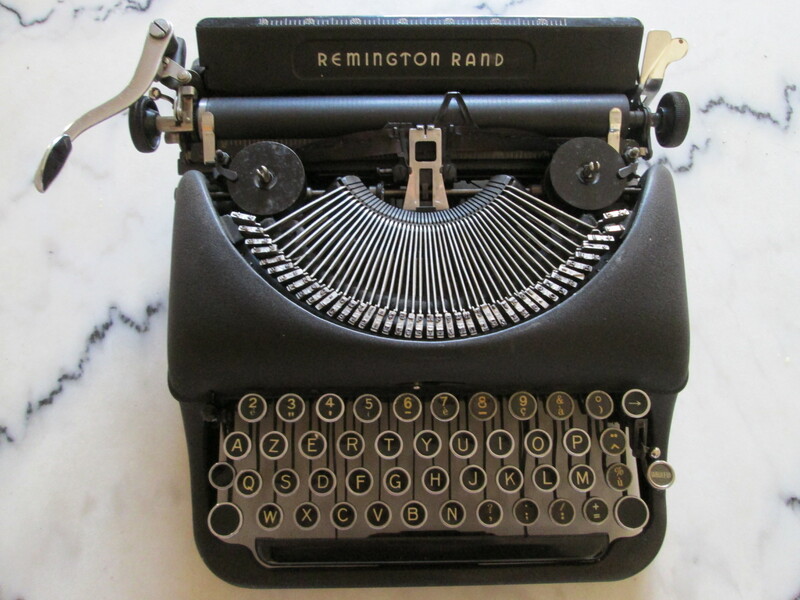 There was no doubt about it: I was looking at a 1940 Remington Rand Deluxe Model 5. Some chap all the way across Paris was clearing out his basement and was selling it for a song. 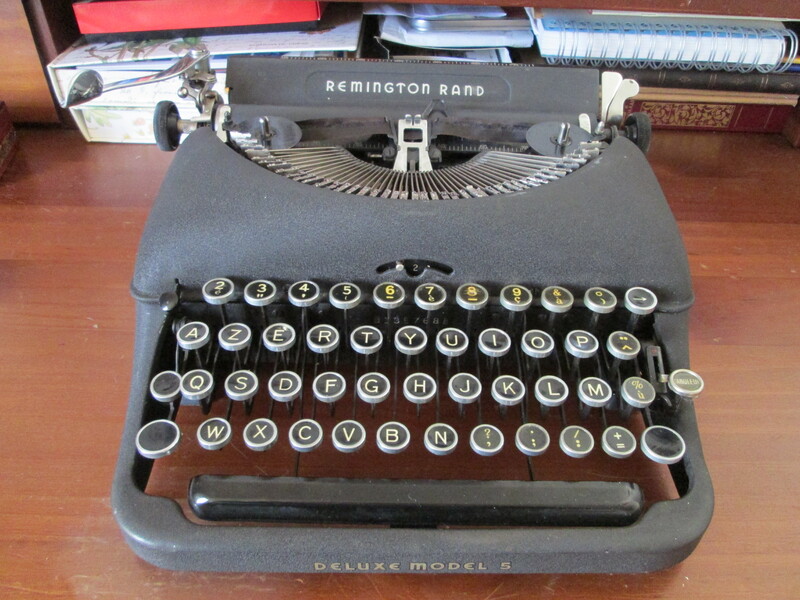 There followed two days of agony as I waited for an answer to the email I had sent off post haste, half-convinced that it wasn’t even worth trying, that the Remington – MY Remington! – had already been snapped up by someone else, that such wondrous strokes of luck never happened to people like me. When at last I received an answer and learnt that the typewriter was still available, I was jubilant! I counted the days till I could go and pick it up, and when, finally, it stood upon my desk in all its splendour (smelling strongly of mildew, I might add! ), I couldn’t stop gloating. I examined it anxiously for flaws but the man hadn’t lied: it was in perfect working condition. Only the key that activated the little bell, signalling the carriage had reached the end of a line, was jammed, but ten minutes of careful jiggling with a knife soon put it to rights. To my delight, though much-used and slightly torn in places, the ribbon even had enough ink still left in it to type several exploratory pages. 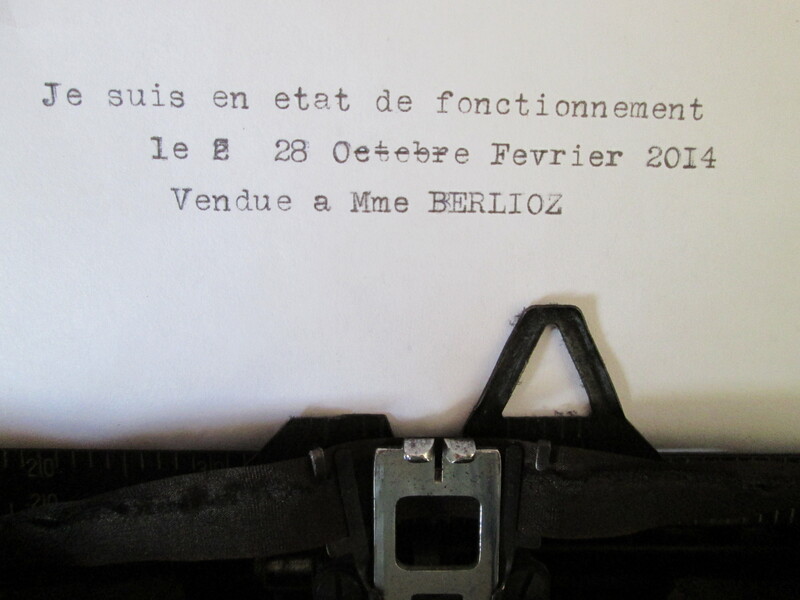 Friends, beware: I sense a veritable avalanche of (typewritten) letters coming on! Cover photo by Sarah Dunn. It was in the Slightly Foxed December newsletter that I first saw mention of this wonderful CD. “Given for Christmas” is a selection of Christmas-themed prose and poetry, read by a stellar cast of British actors and recorded at St Paul’s and Westminster Cathedrals. 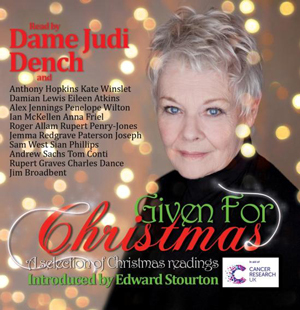 Dame Judi Dench, Jim Broadbent, Sir Ian McKellen, Sir Anthony Hopkins, Kate Winslet, Penelope Wilton, Sam West, and Eileen Atkins are just some of the well-known (and well-loved) actors who lent their voices to these readings.